While the concept behind AMBER Alerts is fantastic, being startled by the iPhone belting out an extremely loud and terrifyingly blaring alarm sound in the middle of the night is not exactly a pleasant experience. This can be made even more frustrating for users who don’t know what the alert is for, and exacerbated by the very generous coverage region for an AMBER alert, where you may be hundreds of miles away from the event epicenter and still get the alarm sent to your iPhone anyway. It’s not recommended, but as with other weather and government alerts, iOS offers an option to disable all AMBER Alerts coming to your iPhone. We’ll emphasize that again; turning off the AMBER alert alarms feature is really not recommended because the system works best when all individuals keep the feature turned on, thus increasing effectiveness and reporting. Unfortunately, disabling the alert is the only way (at the moment) to turn off the petrifying sound effect, which may be appealing to some users who have found the alarms to be an unusual disturbance if not outright erroneous based on their iPhone location, sometimes in a completely different state from where the alerts location is specified. This disables both the the very loud sound effect, and disappointingly, it also turns off the actual important alert notifications too. Why can’t we just mute the AMBER Alert sound effect? Or change it to something less frightening? Ideally, future versions of iOS will offer an ability to simply turn off or change the AMBER Alert sound effect to a much more subtle sound that is less startling, while still allowing the obviously important notifications to come through to everyones devices. Most of us pay attention to every single little beep and boop emitted from our phones and computers anyway, so the aggressive default sound that Apple included is very likely not essential to get our attention. Because of how disturbing the alert sound effect is, many users who hear it once immediately want to turn the feature off completely. That’s obviously bad since it hurts the effectiveness of the program, so clearly some changes are needed. If you’ve never heard an AMBER alert sent to an iPhone, it’s hard to quantify just how disturbing the sound is from iOS. It’s not your standard ’emergency broadcast’ sound that breaks through TV or Radio, that would be much more pleasant, it’s an extraordinarily loud and intrusive sound, overriding whatever the iPhone mute settings, volume settings, alert sounds, and audio preferences of the Do Not Disturb feature. It’s genuinely startling, whether you’re sleeping, sitting around the house, or driving, and if you’re in a room with multiple devices that get the alert at the same time it’s a nearly heart attack inducing cacophony which basically sounds like the world is ending. AMBER Alerts also have another problem; the data sent to your iPhone isn’t exactly clear. Several of my friends recently got one in the US state of Arizona (pictured above). Many of them had never even heard of an AMBER alert before, let alone the sound, and it certainly gives no indication that it’s aimed at helping to locate a missing child. Basically if you don’t already know what they are, you just get the horrifying alert sound on your iPhone with a very vague message that mentions a location, a loose car description, and an alphanumeric number (which turns out to be the license plate) – one of my friends actually thought it was a spam message for auto sales that was somehow dispatched to their iPhone. Furthermore, tapping onto the AMBER alert notification doesn’t do anything, it doesn’t pull up more information, and it doesn’t explain what it is… it just sits under the “Emergency Alerts” section of the Notifications panel, which is also where hazardous weather and events get listed. All of this seems like an oversight that should be fixed so that users can at least learn more details about the alert, and ultimately help to respond to it. It also seems bizarre that the only way to get relief from the sound effect is to completely turn off the feature, so here’s to hoping that Apple offers some changes in a future iOS update to an otherwise important feature. We got one of these at 3AM and it woke the entire house up. Guess what the first thing everyone did was? Turn the feature off on every iPhone in the house. Yea, we get that it’s important, and we’d opt into the notifications without the audio, but the sound is absolutely mortifying. I bet if it were your kid that Amber Alert was for you’d want everyone with an iPhone in the area to see this… Even at 3am. And the TSA is great because it keeps us safe from terrorists! Most users should leave the AMBER alerts on because it’s the right thing to do, but I know many that share your opinion based on the intense sound alone. Hopefully Apple gives us all an option to tone down the sound effect, even using the familiar breakthrough audio signal that comes through TV or Radio with emergency broadcasts would be an improvement. People like you make me sick, why cant the psychos ever kidnap people like you instead. Why are you looking to disable AMBER alerts on your iPhone feature if you’re going to complain about others disabling the incredibly loud AMBER alerts? Curious! I have gotten about 10 AMBER and weather alerts since getting the 5S in March. It is absolutely disturbing whenever these messages come through. The other month when we had all that bad weather in Texas, it was just going off and off and off. My Lumia 520’s alert wasn’t as obnoxious. I don’t want to turn the AMBER Alerts off, because it’s heartless, but I hope that we do get the chance to limit these with Do Not Disturb. We shouldn’t be losing sleep over someone else’s missing child. It’s 2AM, I’m in bed, what use am I in that case? Weather and government alerts are totally different, and should be going through no matter what though. I got this Amber alert along with another one a couple of months ago. Both of them were for children taken several hundred miles away. I understand the urgency and need for this information to go out, but not statewide in a state as large as Arizona. I have turned my notification off. As an Arizonite, I’m fearful that my white children will be kidnapped, exported to Mexico, and sold to China due to fund Obamacare. So I leave my Amber Alerts on (’cause I don’t know where my white children are), and my AR15 by my bedside. I’m surprised you don’t believe that they are sold to aliens from Saturn. Like the notifications that we get from apps, we should be able to adjust whether we get a sound or not, and we should have the ability to set whether the visual notification shows up as a banner or an alert. My biggest beef with these alerts is that we cannot disable the “presidential alert”. The government has no right to FORCE me to receive alerts. Thank you. Turned it off. What a self defeating bit of incompetant design. I appreciate the feature and will turn it on when they (the authorities or Apple) reduce the volume to something appropriate, or better yet let me adjust it. I put my phone on Do Not Disturb at night. I had an Amber Alert go off at 4am this morning on my work-issued iPhone. My personal Android next to it also received the Amber Alert, but it was smart enough to heed DND. Why the heck doesn’t the iPhone respect my DND settings? First thing I did after getting up this morning was turn off Amber Alerts on my iPhone. @Kingsford: The old “I bet if it were your child….” ploy, eh? Nice move. You missed the OP point. They dont want to be scaring the crap out of their households, instead they want to be informed – properly. @Kingsford @Sally The information given with these alerts aren’t very useful for locating a missing child. Very little information is given. The child may have gone missing far away from the iPhone user. It’s not like anyone is saying, “I don’t want the alert because it’s annoying.” We’re saying we don’t want to be startled at all hours for vague information about a situation that isn’t anywhere near us. The idea is good, but the execution is not. Can’t they make it without the sound? I already have insomnia, now I was awakened and can’t get back to sleep! I have to go to work and be alert! The concept is wonderful, the execution is appalling. The tone needs to be adjustable, both in volume and type of sound, and it needs to obey the ‘do not disturb”. If a child has been kidnapped 60 miles from me by someone a blue car, and I’m home asleep in bed, I’m not going to be part of any ‘public watch’ for the car. Sadly I too have now turned it off. When they improve the feature I will turn it back on. Oh, and as an assign. I was blasted in a work meeting (no where near a car or a road) by the ah-woo-gah of the amber alert. I disabled the feature. 10 minutes later I was alerted by the local news channel by a gentle chime with the same information. Much better. Got one at 5 aclock in the morning last night. Article says she was found at 4 aclock and was completely safe. 1 they had no reason to wake me up. 2 why the hell do you need to wake me up to tell me a girl went missing? Just leave a notification and I’ll get to it when I wake up. I’m not gonna be watching for a 1998 ford blue mustang to come barreling down the road for me to report. I’m going to frickin sleep. I’ve had similar experiences which is basically why I turned off the AMBER alerts, I found them to be so annoying, so intrusive, that I had to turn them off completely. You hear one of those sounds, and it’s terrifying. My last straw with the AMBER alert system on iPhone was when I got an alert for a car that was over 1000 miles away…. 1000 miles! Yup that was it. If I’m sound asleep inside my house, there is no purpose to waking me up to tell me a child is missing. That could wait til I wake up in the morning so I could actually do something about it, like keep an eye out when I leave the house. If I’m just going to have a heart attack, turn off the phone, and go back to sleep, that does nothing for the child. But yeah, keep on saying I’m heartless for not wanting to be terrified by that noise while I’m sound asleep. “Heartless”? What a load of pc brainwash. I’m all for the alerts but I will not be woken up after 3 hours sleep when I only get 6 before rushing off to one of my two jobs. The noise those things make are suitable for the “heartful” unemployed. Thanks for showing me how to silence this intrusion. Thanks for this information! I just got the first alert and the sound is outrageous! 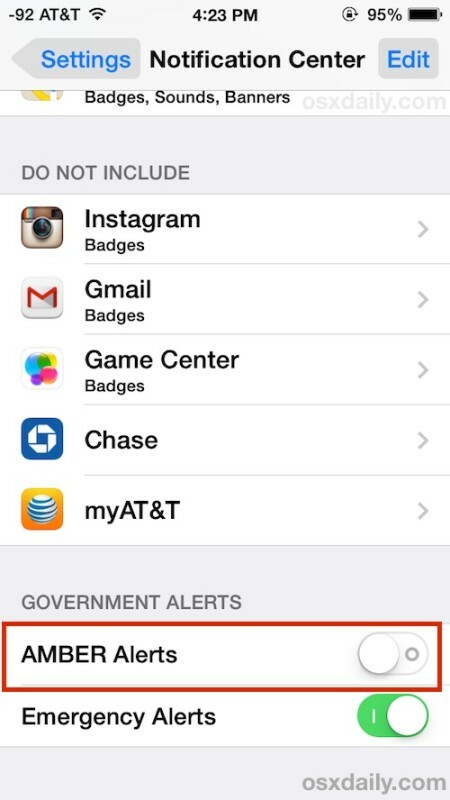 AMBER alerts and emergency alerts are so awful and intrusive that everyone is going to want to disable them. Aside from that, some really silly situations are called on if you follow the news, situations like a grandparent picking up a kid from school. Over reporting non-incidents and the awful sound associated with it defeats the true purpose of the system in my opinion. A text notification on screen without the dreadful sound would be sufficient. I’ve had AMBER Alerts OFF and Emergency Alerts ON for years and that’s worked perfectly. Then today at 4am (Vegas), I was awakened by an AMBER alert. Bottom line is they’re now shoving AMBER alerts through the Emergency Alert feed so you really need to disable both alert types. The sounds for AMBER alert and Emergency Alert are so annoying and so over-used by whoever issues them that you basically have no choice but to disable them on your iPhone, otherwise you’ll be woken up at awful hours or terrified while driving a car. If you’ve ever been in a room with multiple people when it goes off in harmony on everyones phone, it’s terrifying. Everyone immediately turns them off. Defeats the purpose of the alerts of course, but they made them too annoying. What they should do is adjust the sound to be an alert that is moderate in town and deliver them like an SMS messages instead, would be much less intrusive. Here we are in 2017, and the problem still is not resolved! While I appreciate being warned about the floods going on in my county in North Carolina, I would’ve rather read it as a notification setting on my phone when I woke up. (Thankfully, we don’t live in a flood zone.) You would think they would simply notify the phone with at least “hushed tones” when all the phone sounds are off!